The primary objective of the development of the Swing Spitfire was to achieve the maximum increase in the glide-dive range. 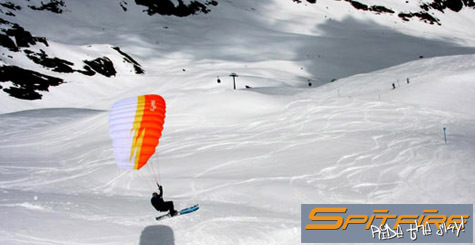 The result is a wing which combines the good glide features and the low launch speed of a speed flyer with the speed riding characteristics and dive possibilities offered by a true speed rider. With this wide glide/speed range, 3 riser system, long trim and brake travel, and newly developed wing materials, the Spitfire leaves nothing to be desired. 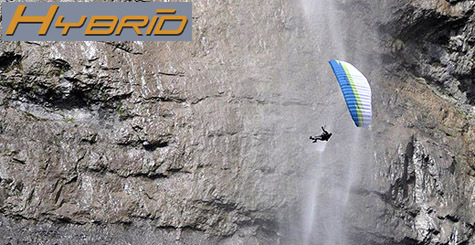 The Swing Hybrid Sport opens up a whole new range of possibilities for all paraglider pilots, whether for hike & fly, soaring in strong winds, a descent method for mountain runners, or even simply for flying with friends. The Hybrid Sport is versatile, offering a sporty and dynamic side to experts and pilots who enjoy experimenting and who are looking for more action and adventure. It is the result of new demands by a generation of pilots who want to experience the "go-cart feeling" with the safety of an all-round glider developed especially for foot launch.